The Royal 3D has 5 DMX channels, 3 operational modes (DMX, Sound Active or Master/Slave), has a wide 90-degree beam angle and only consumes a maximum of 24W of power. Users can also use the UC3 easy-to-use controller with the Royal 3D. This laser is FDA approved. 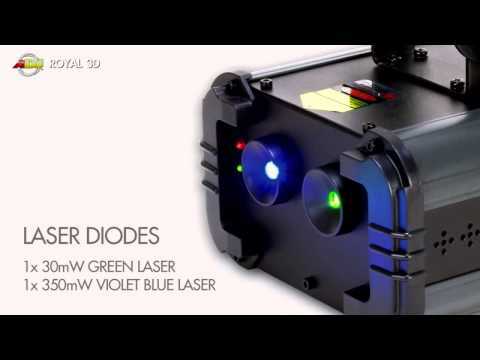 Considering purchasing the American DJ Royal 3D Green & Violet Blue DMX Laser ? Have questions? Ask people who've recently bought one. Do you own the American DJ Royal 3D Green & Violet Blue DMX Laser ? Why not write a review based on your experience with it. 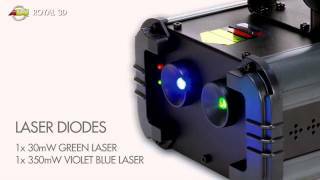 Seen a video for American DJ Royal 3D Green & Violet Blue DMX Laser online or have you own video? Check out American DJ Royal 3D Green & Violet Blue DMX Laser on DJkit.com!